Pacific Media Expo is proud to host the first concert series highlighting the best that the Pacific Rim has to offer in pop music. Pacific Media Expo hopes to showcase both Asia's most gifted performing artists as well as up and coming Asian American musicians. This year's concert will feature Japanese music superstar T.M.Revolution as its centerpiece and rising young star Nami Tamaki as the opening act. Also performing during the weekend will be Silver Ash and Psycho Le Cému. The TMR/Nami Tamaki concert is sponsored by Sony Music International and Tofu Records. Click on the Artist for more information on concert info and venues. 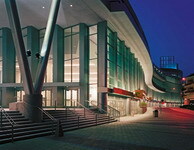 The Anaheim Convention Center Arena is a full concert hall complete with stadium seating. With over 6,000 seats, this venue promises to break records as well as eardrums in a weekend filled with the best music from the Pacific Rim! Photography and video taping at the concert is strictly prohibited. Only pre-approved members of the press will be allowed to take photos/videotape from specific areas of the Anaheim Arena. Any recording equipment found being used at the concert will be confiscated. Due to the high volume of people who will be attending the concert, people with large props or anything resembling a weapon will NOT be allowed into the concert venue. For the concerts that will be held in the Hilton (Psycho Le Cému, Silver Ash, Secret Secret), there will be a multi-tiered ticketing policy. Tier 2: "Premium" ticketholders. Premium tickets are complimentary to Hilton hotel guests. Attendees can pick them up at the PMX registration desk. Any attendee who shows proof of Hilton registration showing their name (e.g. a check-in receipt) will receive a complimentary pair of Premium tickets for the Hilton performances on the day of their choice. Limit 2 tickets per room. Photo ID required. Tier 3: "Priority" ticketholders. Priority tickets cost $10 each and are good for all concerts on the designated day. Priority tickets can be purchased at the merchandising booth. Tier 4: All Pacific Media Expo attendees. PMX intends to have more than enough seating for all attendees, so all music fans should get to see the concerts of their choice!